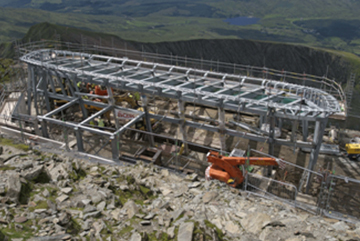 STRUMIS deliver the highest project in England and Wales - The Summit Building, Mount Snowdon, detailed and fabricated by EvadX Ltd.
TRANSPORTING over 100 tonnes of steel and more than 2,500 bolts up a mountainside was never going to be an easy feat and was made a lot more difficult by freak June rainfall! With BIMReview and STRUMIS combined to deliver the detailing and project management tools needed and with sheer determination from the EvadX team, this complex project was facilitated and rapidly concluded within both time and budget. EvadX Limited was established in the early 1980’s and since then has enjoyed a continued and controlled expansion. In more recent year’s considerable investment has been made in state of the art technology, namely BIMReview 3D modeling software and fully automated CNC processing equipment. Direct links through the STRUMIS management information and fabrication system to streamline the EvadX fabrication process from start to finish and provide seamless interaction between departments, suppliers and clients. EvadX were proud to have been chosen as the main steelwork contractor for the new Summit Building on Mount Snowdon. This innovative visitor’s center will provide opportunities to learn more about Snowdon, whilst also facilitating weather information, advice on descent routes, washrooms and naturally provision of refreshments and shelter. Andrew Roberts, Drawing Office Manager at EvadX was the project manager behind the development of this £9 million visitor center. Andrew confirmed that even more so than usual, the collaboration between Engineer, Architect and Main Contractor, Carillion became vital to the success of the project. BIMReview and STRUMIS played a vital role in this project management workflow and are integral to operations at EvadX. Andrew states he was proud to have worked on the centre and said: "you only get to work on maybe one of these in your lifetime, at around 3,560ft tall it must be one of the highest projects in the country." Modeled and detailed on BIMReview, each phase of the project was subsequently fabricated by EvadX with the aid of STRUMIS. Material stock, procurement and all unique project requirements are simultaneously controlled by the STRUMIS system - with all projects monitored and fabricated using specific EvadX routing and benefiting from best practice work flow delivered by the system. With functionality from estimating through contract and budget control during fabrication, combined with visual production tracking and scheduling, STRUMIS provided all members of the project with vital up to date information. 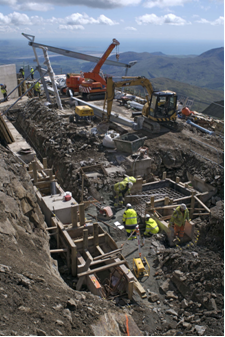 With completion due at the highest point in England and Wales - that attracts plus 100mph winds and temperatures of minus 20 ° C, the fabrication, scheduling and erection process of this project was always mission critical and the STRUMIS system ensured that the project progressed accurately and with maximum efficiency. After fabrication and transportation to site the project was erected by the EvadX team after it was painstakingly lifted piece-by-piece up the mountainside on a tiny railway via a small locomotive. This train journey alone from the foot of the mountain to the summit and back took four hours by the time the train had been loaded up, made its way to the top, unloaded and returned to the base. As a consequence of this unconventional journey all the parts of the steel structure had to be precisely numbered and distributed in numerical order so that they would reach the summit in the correct order; ready for unloading and construction. Andrew commented that if the parts had been sent up in the wrong order the team could have been significantly set back by at least six hours. While there could have feasibly been many issues connected with construction of this unique project, it was the unusually bad weather over last June which made the job even more difficult, as Andrew explained; "the weather conditions were terrible and winds reached 70mph at the summit and a couple of times the train couldn’t get to the workers and they had to walk down the mountain to reach a safe area to be collected". We were all delighted that the team managed to finish the construction and erection of the framework on time and sheer determination and hard work were the order of the day". Andrew continued; "I told everyone that if we were able to stay within our budget - time wise, I would send up a barrel of beer". In part due to the benefits of using STRUMIS and the undoubted hard work of the EvadX team, Andrew made good on his promise and delivered a barrel of beer to the workers as reward for the completion of this most unusual and challenging project. "STRUMIS played a vital role in our project management workflow and are integral to operations at EvadX Ltd. Direct links through the STRUMIS management information and fabrication system streamline the Evadx fabrication process from start to finish and provide seamless interaction between departments, suppliers and clients. With STRUMIS we have the complete fabrication information system".